If you too are finding this level of indulgence both simultaneously alluring and a bit sickeningly excessive, or simply haven't gotten around to doing the Easter egg shop yet, I suggest you do something a little different and bake your own sweet Easter treat. These pretty Easter Nest Cupcakes are a great example of the simple recipes available for seasonal occassions in our Cupcakes book. They combine the classic shredded wheat, chocolate and mini egg combo with a moist cupcake topped with buttercream, what's not to like! 1. Preheat the oven to 180˚C/350˚F/Gas Mark 4. Line a 12-hole bun tray with paper cases. 2. Place the margarine and the sugar in a large bowl, then sift in the flour and cocoa powder. In another bowl, beat the eggs with the syrup, then add to the first bowl. Whisk together with an electric beater for 2 minutes, or by hand with a wooden spoon until smooth. 3. Divide the mixture between the cases, filling them three-quarters full. Bake for about 15 minutes until they are springy to the touch in the centre. Turn out to cool on a wire rack. 4. To decorate, begin by making the buttercream icing. Beat the butter until light and fluffy, then beat in the sifted icing sugar and hot milk or water in two batches. Add the vanilla extract and any colourings. 5. Swirl the buttercream over the top of each cupcake. Break up the shredded wheat finely. Melt the chocolate with the butter, then stir in the shredded wheat and let cool slightly. Line a plate with clingfilm. Mould the mixture into tiny nest shapes with your fingers, then place them on the lined plate. Freeze for a few minutes to harden. 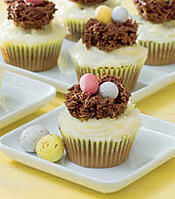 Set a nest on top of each cupcake and fill with mini eggs. Keep for 2 days in a cool place in an airtight container. And there you have it, pretty Easter-themed treats without the hefty price tag! How come eggs like this never existed when I was a kid? Make the most of the looooong weekend with Time Out's top recommendations!